Hostage pt.1 (2010) is the worlds first nano engineered blacker-than-black artwork (7cm H x 7cm W) ‘grown’ from carbon nanotubes able to capture all light at all frequencies. The ultra black artworks consists of approximately 99,9% air and 0,1% carbon, so you literally look into nothing, a void space and the closest you can get to nothingness. Pure horizontal depth. The artwork consist of an ultra dark nano engineered material that absorbs all visible light and some invisible like infrared light, and makes reference to the work of painters like Yves Klein, Malevich, Reinhardt, et al. In contrast to traditional painting De Wilde’s artworks are made from sputtered atomic sized particles (catalyst seeds) on the canvas (substrate), and by applying chemical vapor disposition De Wilde creates a ‘forest’ of vertically aligned, loosely packed, carbon nanotubes held together by the Van der Waals forces. This bottom up technique is novel in the arts and reflects upon the transition from pigments to structural color. The geometry of the nano object is a crucial factor in creating the blackest black. 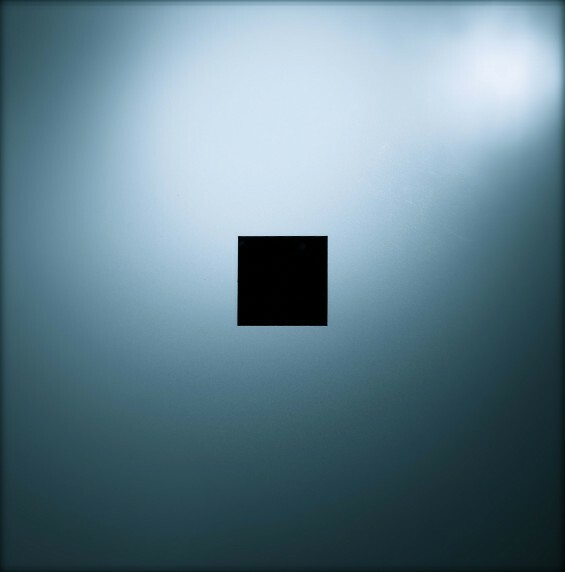 The blackest black is for De Wilde – just like for Kasimir Malevich – a symbol for societal change in a world facing huge economical, ecological and societal challenges. For De Wilde change starts with the individual. Darkness is perfect, because more than light, it turns directly and singularly towards the individual. De Wilde sees his blacker-then-black nano engineered art as a space of refusal, but also as a space of and for imagination. In a time where we’re oversaturated with media and information, it pulls you back to something that is private and personal. In absolute darkness everybody is the same, things are forged and unified. For Yves Klein it was the blue sky for De Wilde it’s deep space. Compared to deeper cosmological mysteries like the identity of dark matter and dark energy or what’s going on inside black holes, there are other unknowns that appear more mundane, their solutions seemingly within reach. But despite appearing to be a tractable problem, one mystery has managed to persist for almost the entirety of the past century, making it one of the longest-standing problems in astronomy. About a century ago, researchers observed the telltale signs of absorption of light by unknown molecules that reside in the thinly spread material in the space between stars (the interstellar medium). The gas and dust of the interstellar medium absorb certain wavelengths of light, preventing those wavelengths from arriving here and leaving gaps (or lines) in the spectrum we record when we look at other stars. Researchers can find out what substance, or “carrier,” is responsible for the lines by identifying molecules that absorb the specific wavelengths that are missing from the observed spectrum. Combining this lab research with theoretical modeling and more astronomical observations has allowed us to figure out what’s lurking in interstellar space. But despite some successes, there are still a lot of unidentified absorption lines in the interstellar medium, partially due to technological difficulties. Today we can genetically engineer life and stitch atoms together to create new chemicals. Yet, we still don’t know how life started a few billion years ago on Earth. One hint is that it got help from outer space, where some molecules seeded life on Earth. Scientists have very recently discovered that gaseous buckyballs exist in space. The discovery, published in Nature, doesn’t just confirm the hunch scientists have had that buckyballs may be ubiquitous in space—it also solves a puzzle astronomers have been struggling with for more than 100 years. One such molecule implicated in the origin-of-life story is the buckyball, which is made of 60 carbon atoms arranged in a football-like shape. The discovery of this unique form of carbon, which is found in abundance of Earth but hadn’t been detected till 1985, won the discoverers the 1996 Nobel Prize in chemistry. For years, astronomers have been using absorption spectra to understand what objects in space are made of. An absorption spectrum of white light passing through a spectrometer would look like a rainbow. However, if there is any chemical present in the medium in which the light flows, the high-resolution spectra will show tiny black lines. These black lines occur where light is absorbed by the molecules of the chemical, and they do this in a predictable way so that we can work backwards to find out what the chemical is.In the absorption spectra of space, some black bands have been a mystery. They appear fuzzy, and scientists haven’t been able to find a chemical capable of absorbing that amount of energy. These bands are called diffuse interstellar bands, and were first discovered in the 1900s. Now, researchers have confirmed that buckyballs are responsible for creating these diffuse interstellar bands. To do this, they cooled down gaseous buckyballs to -267 °C (close to -450 °F), to mimic space conditions, and measured the absorption spectrum through these molecules. The absorption patterns were similar to those found previously in space.